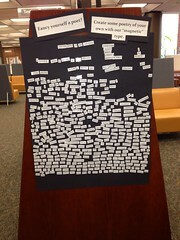 On October 22, from 2-4 p.m., I held a teen program at the library. To my surprise, 14 wonderful teens showed up to put their culinary skills to the test. I was a little worried at first, as my judges were dropping like flies! Thankfully, my patrons really stepped it up and I had four volunteers before noon! They were troopers, tasting all of the insane combinations my teens came up with. Not only were my judges wonderful, but the community itself donated a huge chunk of the supplies. Fahrmeier Farms, located just outside of our town, donated three MASSIVE boxes of produce for the kids. The boxes contained green peppers, tomatoes, sweet potatoes and turnips! Half of the kids had never seen a turnip, let alone tasted one. It was a great experience for the teens and The University of Missouri Extension donated some education materials for the kids to take home. Each of my teen participants went home with some fresh produce, a small cookbook, a book from my “prize cart,” and brochures about healthy snacks. The program was a spectacular success, one which I will definitely try again. I set the competition up a little differently than I normally do. Most of the time I have my programs scheduled down to the last second. This time, however, I decided to “go with the flow” in terms of time. I didn’t tell them how much time they would have to create each of their dishes, except for their appetizer. The “Quickfire Appetizer” round was their first challenge and I definitely made them dive into the competition. 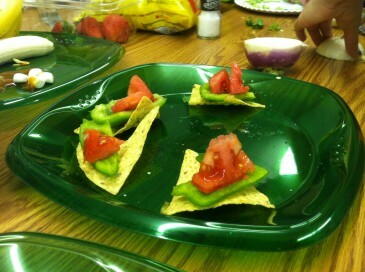 Each of the teams (anywhere from 1-3 kids) were told that they had to create an edible appetizer for the judges. They could only use 3 ingredients, it had to be able to be consumed in one bite and they had 15 min to do it! 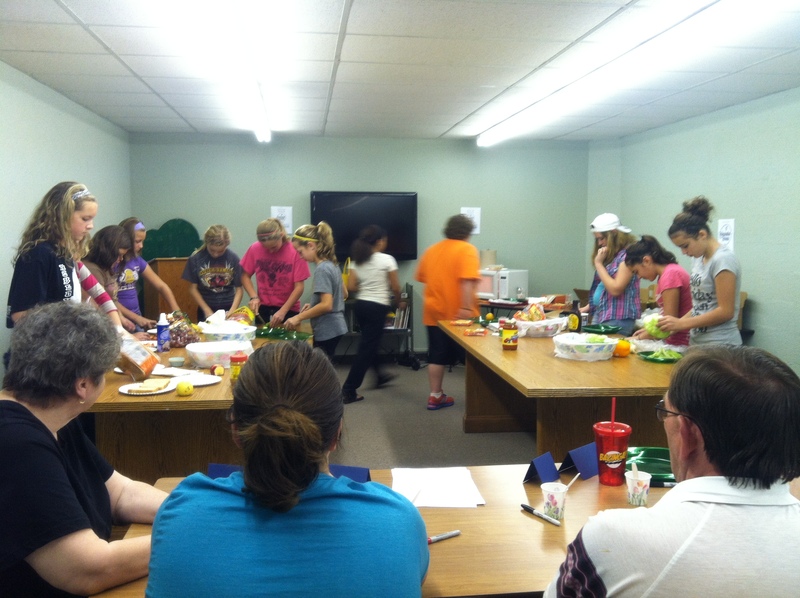 The kids really stepped it up, a lot used fruit to make their dish. The next round was the “Entree Trivia” round. 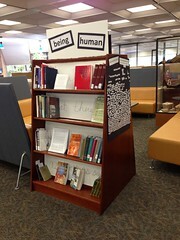 I actually borrowed this idea from another library and it worked really well. I created a series of trivia questions geared to middle school age kids and each team was asked three questions. If they got a question right, they were allowed to choose an ingredient that no other team was allowed to use after they had picked it. This forced the kids to create dishes that were unique. The entree round was the longest at 30 min, but I made them all clean up their chef’s stations. I told the kids the judges were also counting cleanliness in their total scores! 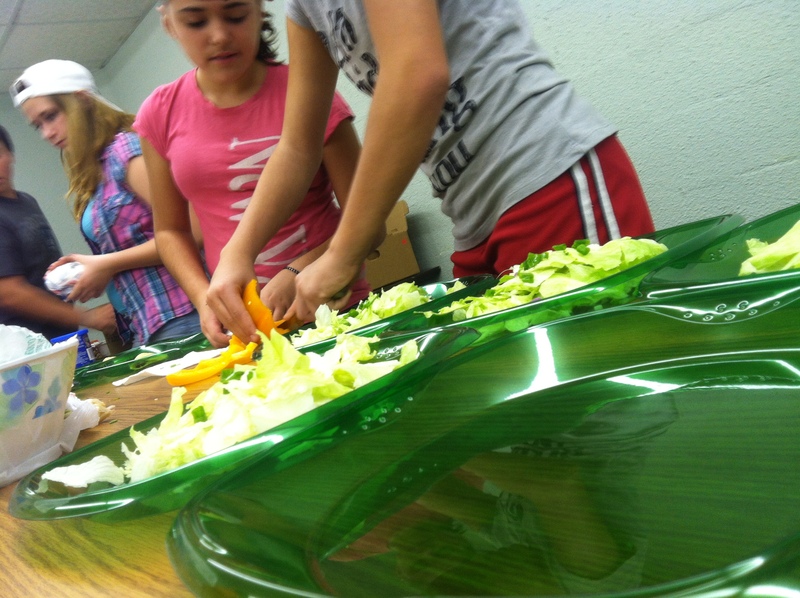 The donated ingredients were a hit, a group tasted turnip (they thought it was an onion) for the first time! I thought it was amazing that some of these kids were trying it for the first time! The final round was the “Healthy Dessert” dish. I was trying to promote healthy, local/seasonal foods and so the rules of the dessert round were a bit tricky. Each team had 25 min to create a dessert using ANY ingredients, including the ingredients that had been off-limits before. The only stipulation was that they had to utilize one vegetable in their final dish. I figured that, since the kids had been able to taste the majority of the foods, I would have a few who sweetened tomato juice, used sweet potatoes as a paste or marinated the turnips in a sweet juice concoction. The kids really struggled with this challenge though. A few took the challenge literally, dipping vegetables in chocolate sauce. 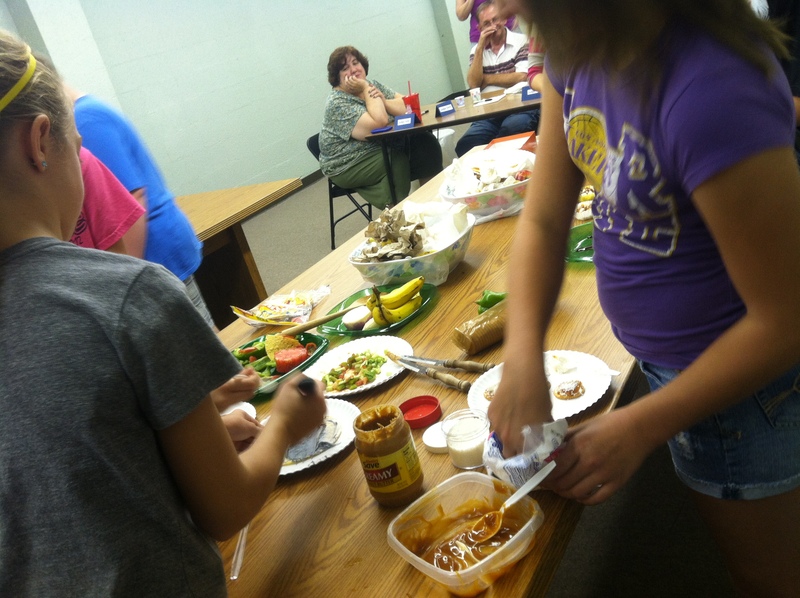 My judges were troopers though, and took a bite of EVERY dish (no matter how crazy) the kids came up with! Kudos to them! If you have any questions about the shopping list, getting food donations or planning the program. Shoot me an email and I will be more than happy to share my resources with you. I have the trivia questions already typed up and the “itinerary” for the program saved. I even have the judges ballots I will let you have. I will post everything on Scribd when I get to work on Tuesday. The shopping list was really dictated by what was seasonal (trying to teach kids about eating healthy) and what was ultimately donated to us by the CSA. Depending on where you live, you may contact some of the local farms that are at the farmers market and see if they are willing to donate a box of fresh veggies. I also went through my local University Extension Office and talked with the nutrition department. They were more than happy to provide educational resources and material! As far as cookbook donations, we weeded the libraries cookbooks (old cookbooks) and also asked for a donation from several local bookstores (used books and new books) to use as prizes. A few weeks ahead of everything, I contacted people who I thought would make good judges and also made a poster asking for volunteer judges. Make sure you purchase a box of gloves (for sanitary reasons) so the kids can wear those while they handle the food. Shoot me an email aroundthestacks[at]gmail[dot]com if you have any questions!